Supporting patients at all stages – from harnessing the immune system to create new treatments, to helping people living with cancer to self-manage their condition. According to Cancer Research UK, there were over 350,000 new cases of cancer in 2013 in the UK alone. At Southampton, we have an innovative, multidisciplinary approach to cancer research that supports patients at all stages of their condition. We are developing new drugs to kill cancer cells, while also providing tools to support people who are living with the condition. 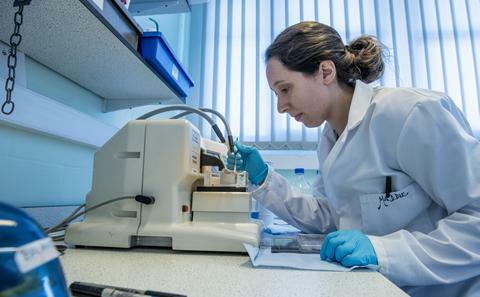 “One of the University of Southampton’s specialities is investigating immunological mechanisms that might be used to develop new therapies and diagnostics, particularly in cancer, and taking them through first-in-human clinical trials and beyond. We do this in collaboration with Cancer Research UK, research councils, other charities, biotech businesses and larger pharmaceutical companies,” says Tim Elliott, Professor of Experimental Oncology, Director Elect of the new Centre for Cancer Immunology and interim Pro Vice-Chancellor for Enterprise. An example of this is the development of a monoclonal antibody, ofatumumab, which has contributed to the global decline in deaths from non-Hodgkin lymphoma. This drug started life through a collaboration between Martin Glennie, Professor of Immunochemistry, and Dr Jessica Teeling, Associate Professor in Immunology, who at the time was working at the Danish biotech company Genmab. “I was doing a sabbatical at Genmab and collaborated with Jessica and colleagues to investigate antibodies that engaged and killed lymphoma cells – the rationale behind using immunotherapy as a cancer treatment,” says Martin. In collaboration with Genmab, the researchers developed this drug through initial preclinical characterisation to show it was potent and safe, phase one clinical trials to confirm its safety, right the way through to much larger phase three clinical trials to show its efficacy. “It had an extremely rapid ‘discovery to development’ time window: the paper that describes the drug was published in 2004, the patent was granted a year later and approval from the US Food and Drug Administration (FDA) followed in 2009,” making this one of the quickest ‘bench to bed’ approvals says Tim. Ofatumumab, marketed as Azerra, is changing the treatment options for the most common adult leukaemia, called chronic lymphatic leukaemia (CLL). It is also being explored as a treatment for other cancers, including non-Hodgkin's lymphoma and serious autoimmune conditions such as multiple sclerosis (MS). “This drug has the potential to have a huge impact: over 13,000 people are diagnosed with non-Hodgkin’s lymphoma every year and they are all potential recipients – if not now, at some point in the future. Commercially it has also been very successful; it was licensed to GSK 10 years ago for just over $2bn,” says Tim. Building on successes like this, the University’s new Centre for Cancer Immunology will focus on investigating how our immune system interacts with tumours. One of the Centre’s main research areas will be understanding how killer T-cells can be made to recognise that a tumour is foreign and leave the normal tissue surrounding the tumour unharmed. “A great deal of our research concentrates on the use of monoclonal antibodies to activate anti-cancer T cells in patients and will, I hope, take a pathway to clinical use like the one I described for ofatumumab. But we have other areas of interest that are more exploratory. For example, one of our recent discoveries is that an enzyme – called ERAAP1 – that is responsible for ‘chopping up’ the tumour genome into chunks that can be recognised by killer T cells, is highly variable in the human population. This might explain why some people’s immune systems respond to cancer better than others,” says Tim. Working with colleague Dr Edd James, also in the Cancer Sciences Unit at the University and funded by Cancer Research UK, Tim’s team has found a similar association in a particular type of head and neck cancer caused by human papilloma virus. “The patients with a better prognosis have lots of killer T-cells in their tumour, and crucially they have a particular variant of this enzyme. We think that the enzyme is important for generating the antigens that the killer T-cells can see as foreign on the tumour cells and that's really crucial,” says Tim. His team is now working with several pharmaceutical companies to look for molecules that can bind to this particular enzyme, in the hope it can boost its activity in patients that need it. The multidisciplinary ethos we have here at Southampton was key to this discovery, Tim explains: “Over many years, we have built up a culture of collaboration, which really stands out as being something special. Southampton researchers have been developing cancer immunotherapy for around 40 years, and we are a leader in the field. This is partly because we’ve got mixed teams of clinicians and scientists all working in the same group, with a shared goal,” says Tim. At the other end of the spectrum, our research is supporting people who are living with cancer, by providing innovative digital interventions to help them self-manage their condition. The late George Lewith, Professor of Health Research, was part of a multidisciplinary team developing a digital platform to help older men with prostate cancer manage their anxiety. “Because we are getting better at diagnosing prostate cancer, this condition can be detected at a much earlier stage. However, for older men with low-grade prostate cancer, surgery does not improve their 12-year survival, so what we need to do is monitor and support these patients,” George explained. Funded by Prostate Cancer UK, the researchers have developed the intervention, called PRO-ACTIVE, in collaboration with patients. 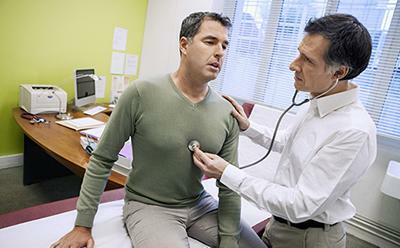 “Cancer recurrence is a big fear for anyone with low-grade prostate cancer, for example, so through PRO-ACTIVE we can give the men support and resources to help them manage their anxiety. With this approach, healthcare professionals can provide support to a large number of people very efficiently and quickly,” George explained. Developed in collaboration with patients, PRO-ACTIVE is based on the unique LifeGuide open source software, which was developed here at Southampton. LifeGuide is a free resource that enables health professionals to give tailored information and advice to patients as well as supporting behavioural changes by setting realistic targets. The team is now undertaking pilot trials on PRO-ACTIVE at Southampton General Hospital and University College London Hospital, and it could be available to patients in the next three years. Paul Little, Professor of Primary Care, and Lucy Yardley, Professor of Health Psychology (who pioneered LifeGuide), with George as a co-applicant, have recently received a £2.5m programme grant from the National Institute for Health Research to create another community-based digital survivorship intervention. This is designed for patients in primary care with breast, prostate and colorectal cancer and it will also be based on the LifeGuide platform. “It is well known that diet and exercise are very important for improving the quality of life of people living with cancer and also affects their recovery. We will be providing this health information in a digestible way, and enabling patients to set themselves achievable goals,” said George. For more information on the Centre for Cancer Immunology visit www.southampton.ac.uk/youreit. Instigating step changes in public health, both in the UK and internationally. 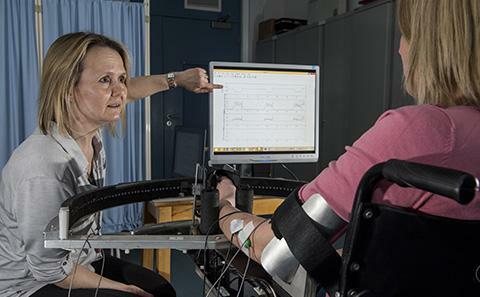 Southampton researchers are developing innovative solutions to help people recover from stroke. Protecting against memory and behaviour changes by regulating inflammation in the brain.